Vietnam – Sometimes the wrong train will get you to the right place. Hanoi is a city that’s absolutely teeming with life. It was evident as soon as we began to make our way from the airport. By the time we finally made it to the old quarter, there was hardly an inch to walk where there was not another person, scooter, cat, dog, rat, or small pile of burning paper. There were countless people sitting on small plastic stools next to street-side food stands or beer stations on the corner. We were tired from the journey, but rejuvenated by the vibrancy all around us. We checked into our hotel and decided to go explore the town a bit. Considering that Vietnamese food is one of our favorite cuisines, we were excited to get a taste of what it’s like in Vietnam’s capital. Our first meal, fittingly, was pho. Disappointing would be an overstatement, but we certainly had our hopes very high considering we were heading to a place that was described as “the best” by a Hanoi native. The pho was good, but it was certainly a bit different from what we were used to getting in the west, which was a trend we started noticing while there. As it turns out, it is a bit different in the north of Vietnam, even though it’s technically the homeland of pho. The people of Ho Chi Minh City in the south are the bringers of most of the pho to the west, so naturally, we’re more accustomed to the southern variety. Hanoi’s, by contrast, is subtle and simple, lacking the huge array of condiments that we’re used to. Next, we moved to a terrace bar next to Hoan Kiem lake, overlooking the madness of the traffic and pedestrians below. The bar lost power several times, but nobody seemed to mind. After we had a couple beers in us the exhaustion began to set in, so we headed back to the hotel. Most of our time in Hanoi was spent wandering around the old quarter and eating good food. As we began to learn, all the food in Hanoi was a bit different from what we were used to, all but the bun cha, at least, which proved to be a favorite of ours there. It was basically the most fantastic bun cha ever, which, we suppose, is no surprise considering that Hanoi was described as a town “transfixed by bun cha” by Vu Bang in 1959. Another thing we noticed about Hanoi? They like to drink. In fact, we discovered the phenomenon of bia hoi in the city, and found it quite to our liking. It’s basically draft beer, but a very small fraction of the price of any mainstream beer, and it’s made by small brewers around Vietnam. It’s made and delivered daily, and consumed quickly and with gusto at small streetside bars all over Hanoi (and indeed Vietnam), but nowhere is it more prevalent than on Ta Hien in Hanoi. We were given a clue to its existence by our hotel staff, and fortunately so, because we saw oh so many other backpackers needlessly throwing away vast quantities (in comparison, of course) of money on import or bottled local beer. The distribution and allocation of bia hoi was a thing of mystery, however. Governed, it seems, by a strange logic, ungraspable by us. 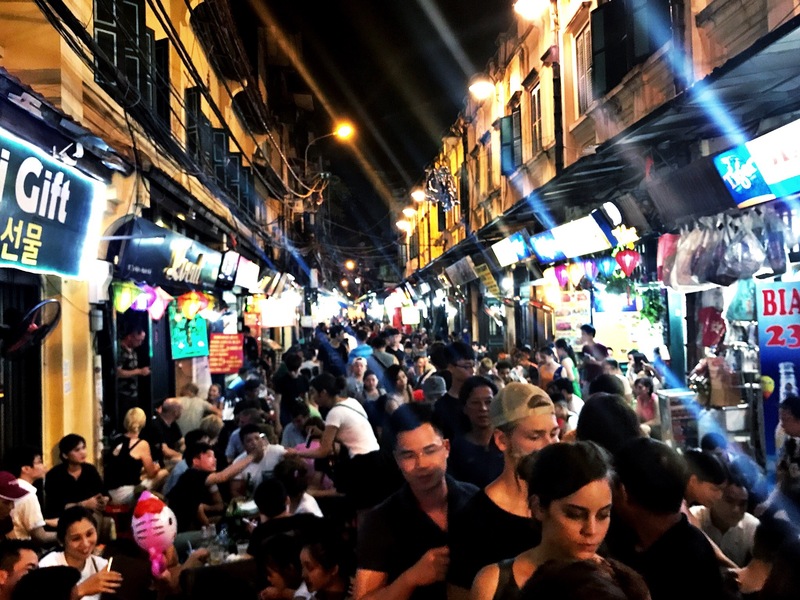 The streets around Ta Hien were packed to the gunwales with revelers, drinking and eating on the sidewalks, we would wander up to this bar or that, uttering “bia hoi?” to the various touts. They would frown and shake their heads, more often than not, and occasionally point us in the direction of another bar that may have it. We eventually found a place that did, and sat at a plastic table next to the street. Glass after glass we slugged back (it’s considerably weaker than a standard beer, at only 3% or so), and we concluded that it’s pretty delicious. On top of that, we spent 40,000₫, that’s $1.75 on eight beers, if you’re bad at math, that clocks in at just about $0.20 per beer, which is definitely the cheapest beer we’ve ever had. We eventually blew the lid off to a couple of tourists sitting near us, to their utter astonishment, and they tried to order a few but the waiter just said “no more!”. So maybe they ran out? Or maybe it’s for limited distribution only. Most places, it seems, were much more willing to sell it alongside food, since it’s so cheap that it’s hard to make a profit from. Much of its distribution is not, strictly speaking, legal either. 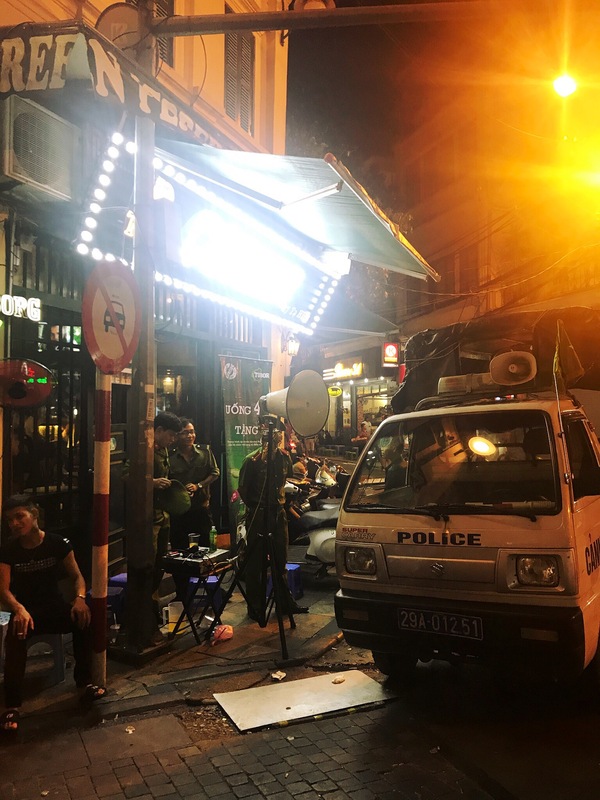 Ta Hien is the subject of fairly frequent police “raids”, which are in reality little more than shakedowns to collect some money from the local bar owners. While we were sitting on the sidewalk, bia hoi in hand, we’d be quickly ushered back into the bar as word spread of police activity at the end of the block. All the fold-up tables would be quickly stashed, the chairs moved inside, hushed tones urging that we keep a low profile. The same scene would be playing out all down the block, with a rush of bodies indoors; the street left eerily quiet. After a short while, it would somehow be concluded that the coast was clear, and we’d move back outside. This happened five or six times that night (which we’ve heard is more than usual), but after the third or fourth time we just stayed inside. A nightly occurrence at Ta Hien. We didn’t want to join one of those prepackaged tours to Ha Long Bay from Hanoi, the number of which surely is in the hundreds, so we instead opted for just bus transport to Ha Long City from one of the many tour operators in town. After a good four hours on the road, with a few stops for “shopping” at the tour operator’s friend’s warehouse or something like that, we made it to Ha Long City. 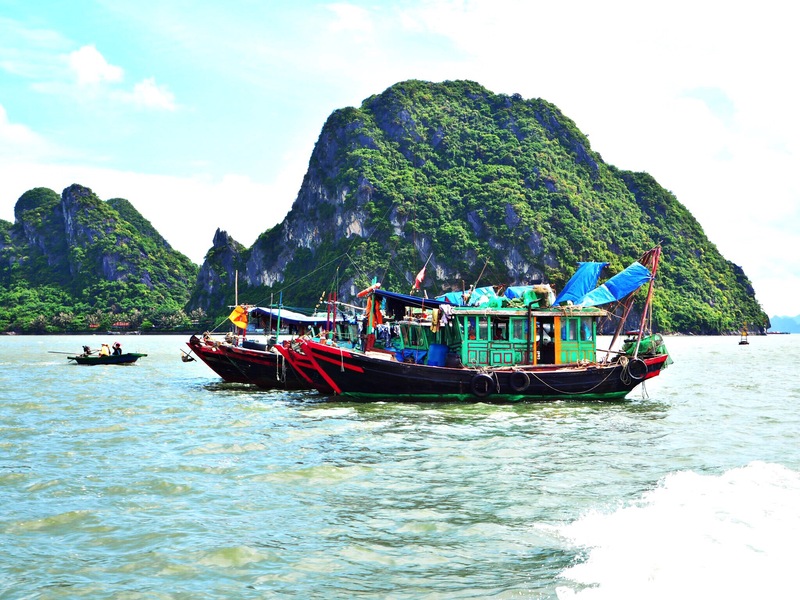 Since our destination for the day was the sleepy island of Quan Lan, considerably farther east of most of the action in Ha Long Bay, we hopped in a taxi from the bustling port over to Hon Gai terminal, on the other side of town. We were handily ripped off by the meter, and ended up owing nearly 200,000₫ (almost $9) for the 15km trip. A boy and his boat at Hon Gai. The Hon Gai terminal was nearly empty, but a cheerful woman behind a makeshift counter wearing a nón lá announced our presence with “you go Quan Lan? !” She was right, and we booked a few tickets (200,000₫ per head for foreigners) on the ferry set to depart at 2pm. It didn’t leave until a bit later, and we were two of three passengers on board, and the third passenger was helping out with crew work, so we’re not sure if he was really just a passenger or what. The cruise through the bay on the way to Quan Lan is beautiful, and we had the whole boat to ourselves. After about 90 minutes we arrived at the dock in Quan Lan, and a couple tuk tuk drivers offered extortionate prices for the 2km ride into town. We eventually talked one of them down to 30,000₫ and were on our way. He stopped at Tuan Thuy, and made the universal signal for “sleep”. The hotel was on our list from preliminary research on the island, so we gave it a look. The staff didn’t speak any English, but the room was nice. They were asking 600,000₫ for two nights, but easily accepted our offer of 500,000. We surely could have gotten it for cheaper, but we were tired and in no mood for walking around town. The town is pretty sleepy, but sports a nice temple and a somewhat interesting graveyard on the outskirts. There seemed to be quite a few food options on our first foray down the street, but many of the restaurants were closed or otherwise unstaffed. We ended up eating most of our meals at our hotel, which turned out to have surprisingly good food, and the proprietor seemingly was always reclined in front of the TV in the lobby, ready to take our order. 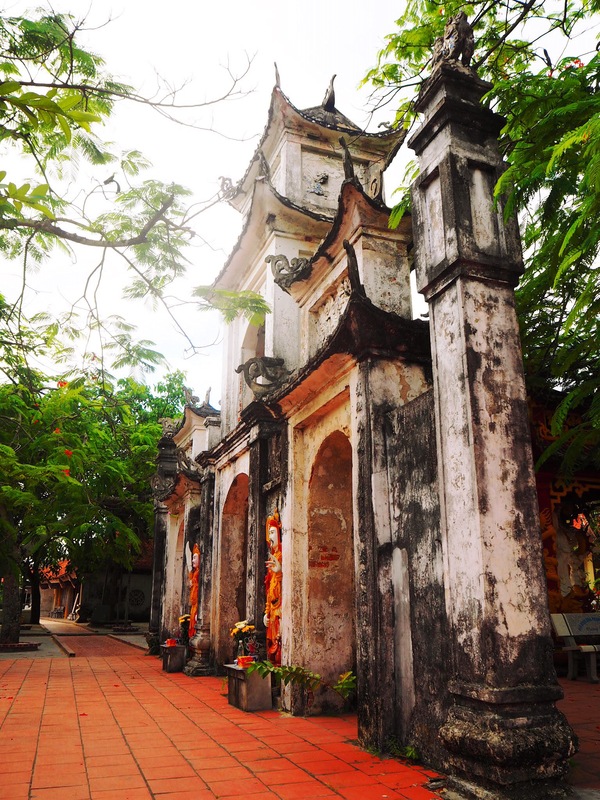 The temple in Quan Lan. The island’s main attractions are its beaches, but they’re not that great. As we’ve said before, we’re a bit jaded when it comes to nice beaches, but these ones are seriously not very spectacular. We spent a portion of the day on Son Hao beach on the east side of the island. It’s big, and there is a lot of white sand, but the water is quite murky and there’s quite a bit of trash on the island. On the plus side, we had the entire beach to ourselves. In fact, we only spotted a couple westerners while we were there, as we quickly crossed paths on the highway. 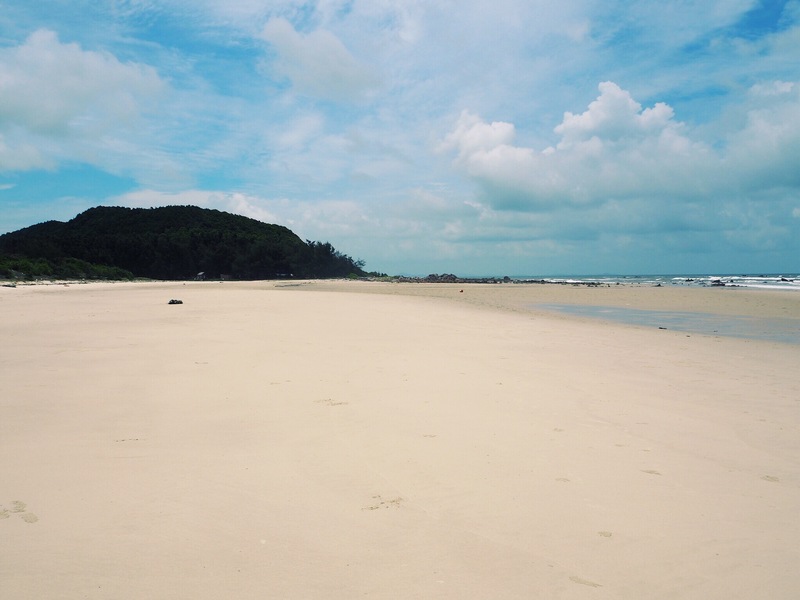 Son Hao beach, Quan Lan. Apart from the beaches, it was a fairly interesting place to spend a day or two, but there’s really not much going on. 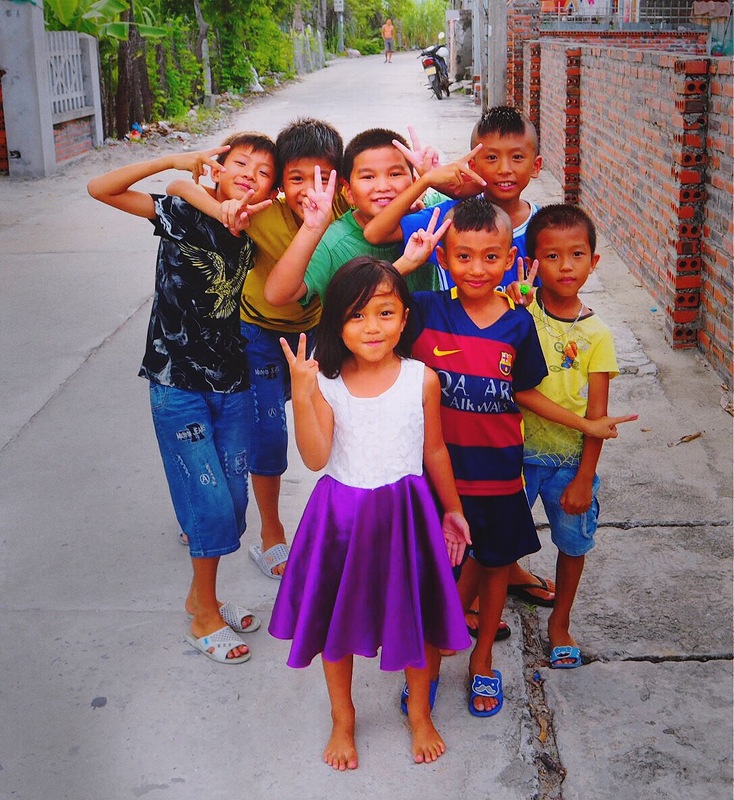 We basically just rode around the island checking out the different corners, and then spent some time wandering around Quan Lan town, much to the excitement of the local kids. They were pretty pumped about us. 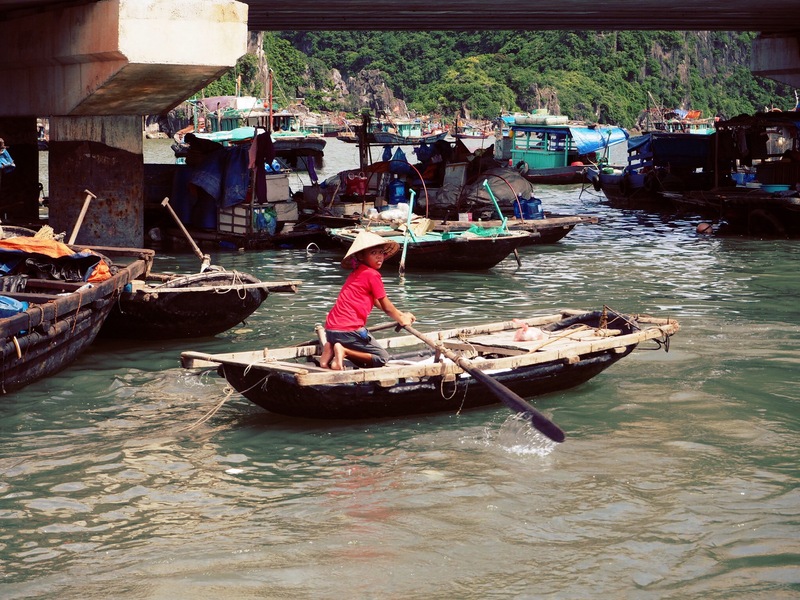 Some boats at low tide in Quan Lan. Some generations-old rice paddies on Quan Lan. We determined that a ferry was leaving at 7am the following day (and we think every day? ), and possibly another one at 7:30am, in addition to one or two in the afternoon. As we were heading back to Hong Gai, we hopped on the 7am departure after not quite enough sleep. The rain was battering the ferry in heavy sheets, but it fortunately lifted a bit by the time we made it back to Hon Gai. We got a taxi to the Bai Chay bus terminal on our way to Ninh Binh that afternoon. The taxi from Hon Gai to the Bai Chay station was 100,000₫, but again, we probably could have bargained a bit if we felt like standing around in the rain looking for other taxis, which we did not. The rain was absolutely smashing down with astonishing force by the time we made it to Bai Chay, and we ran through about 5cm of standing water in the parking lot of the bus station on our way to the ticket hall. The woman informed us that the next bus would be leaving in 30 minutes (we arrived just after 9am, so we likely missed the earlier departure by only a few minutes). The cost of the ticket to Ninh Binh was printed as 120,000₫, but the conductor had other ideas. We think he may have made a bad sports bet, or spent all his wife’s money on booze the night before, because he was inexplicably overcharging everyone, locals included. He’d yell about this or that in angry Vietnamese, and point to the door for anybody who argued. We put up a fight for a few minutes until we were near certain that he’d throw our bags out into the rain, and we eventually paid up the 150,000 he was demanding. The bus took a little over four hours as we bumped our way down the road, stopping every few hundred meters to shout at yet more bystanders, trying to coax them into our bus. The conductor even tried pulling people inside as a last resort, but they mostly wriggled free and stared in disbelief. Every possible inch of space in the bus ended up being used, people packed in here and there while the conductor was greedily counting his money. Needless to say, we were happy to get off the bus. There was a quiet and unobtrusive man who offered us a room at his hotel down the street. Since we didn’t have a booking, we decided we’d give it a try. He showed us a nice room in an otherwise totally empty Kinh Do Hotel, and we talked him down to 250,000₫ for one night. His English was surprisingly good. Our plan was to head out to explore Ninh Binh’s impressive surrounding scenery the next day with a rented motorbike and leave for Hue that night on a sleeper bus. As it turns out, all transport options southbound were full. We were not expecting that at all, which is why we didn’t book in advance. We were left with either the option of staying another day, which we didn’t really want to do, or heading back up to Hanoi and flying down. We opted for the latter, as the tickets were fairly cheap and the trip back up to Hanoi is only 2.5 hours. All told, we’d get there much faster than the train or bus even including the backtrack. We did end up spending the day exploring around Ninh Binh though, which is magnificent. We first went out to the hilariously-named Bich Dong, which is actually very peaceful and an all around lovely place. Once we made it to Tam Coc, there were quite a few more western tourists, and we suppose it’s the more common base for activities around there than Ninh Binh, which is not such a great city itself. Fortunately, there weren’t too many tourists when we were wandering around the temple grounds, and we found quite a bit of solitude. After that we headed up to the Hang Mua lookout to get a better view of the surrounding area. The climb up the stairs was pretty hot, but the view was spectacular. The towers of karst breaching the otherwise totally flat lowlands was a sight to behold, and the limestone leviathans continued into obscurity dozens of kilometers towards the horizon. We sat atop the viewpoint for some time simply admiring the beautiful views, and watching the boats cruise down the river below. The view from Hang Mua. The view back towards Ninh Binh. Our last stop of the day was Hoa Lu, the ancient capital of Vietnam from the 10th century. The area was quite lovely, and the drive to get there passed through scenic villages and the same lowlands we had seen from Hang Mua. There are some old buildings in the area, and a somewhat unexplained huge vacant lot (which may have been the ruins of some older buildings? 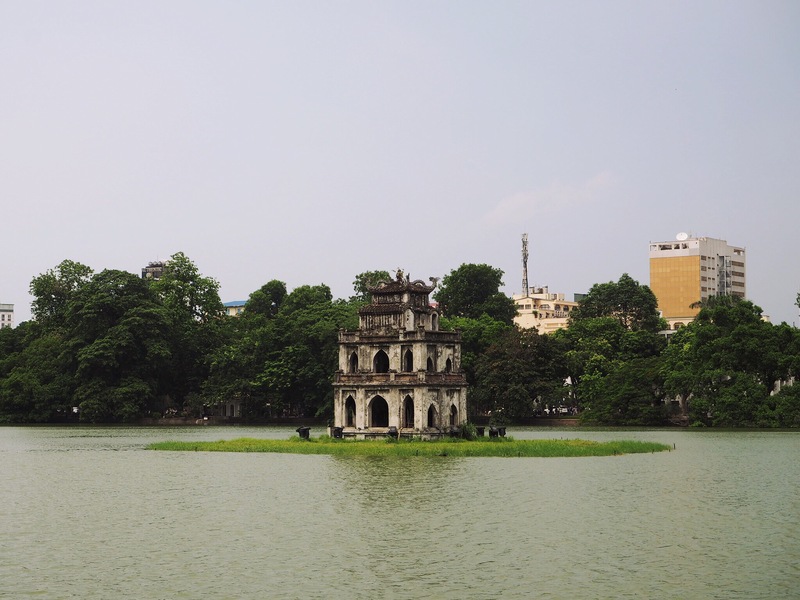 ), but the highlight of the area is the Temple of Đinh Tiên Hoàng, which is a centuries-old temple surrounded by harmonious gardens and a small moat. 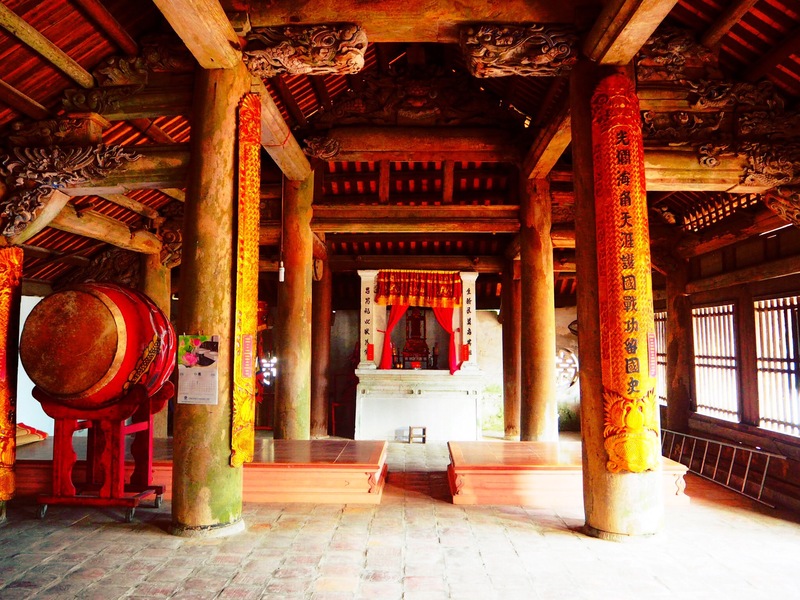 The temple in Hoa Lu. The mediocre view from our misguided hike in Hoa Lu. We made a questionable call by climbing the stairs next to this temple. The lower portion was OK, but as we neared the top we tried our damndest to find a viewpoint, which included scurrying up sharp karst faces (in our sandals, to boot). Not much of a view was gotten, and we were left scraped and sweaty with shaky legs. There was a somewhat nice temple nestled in the rocks near the top though. The rocks at the top were surprisingly sharp. We had worked up an appetite for some bia hoi from the day’s activities, and sought to find some in Ninh Binh. We asked the hotel where to find it, and they gave us some sketchy directions. We set out looking for it, and ended up finally finding it in the one place in our immediate vicinity we didn’t check first, after wandering around nearly every other corner of the neighborhood for a good 45 minutes. We were about ready to give up, but as we rounded a corner we saw promising signs, and heard the rowdy banter of drunk locals from down the block. All eyes were on us as we strode up and took a seat at one of the few unoccupied tables and ordered a few beers. Just as we were finishing up our last beers, a local worked up the courage to come and talk to us. His English was broken, but he had no problems using it, which was endearing. We talked for awhile and ordered a few more beers. He invited us over to his table, which was occupied by six or eight older guys who looked like they were no strangers to this establishment. Our liaison was the only one who spoke any English, so he translated the questions of the other folks, and we got up a pretty good repertoire. They insisted on serving us shot after shot, and proposed numerous toasts which apparently called for chugging a beer in its entirety. We ate whole fried fish and shrimp from plates thrust towards us, and devoured bowl after bowl of noodles. According to Vietnamese customs, we were guests, and were to be treated like them, so they refused to accept a penny of our payment. Our impromptu crew at the bia hoi joint. Finally, as the table’s size begin to dwindle, the few remaining comrades insisted that we visit their homes, to speak English with their kids. We felt bad keeping the kids awake, as it was already 11pm, but there was no way we could wriggle out of it. We visited two houses, in sequence, and were served the finest of tea with a few more shots of some sort of local liquor and were thoroughly impressed by the kids’ command of English, particularly their accents. We are convinced that they’ll be near native by the time they’re adults. We eventually saw ourselves out at around midnight, and stumbled home (which was fortunately not too far away). We awoke to excruciating hangovers, and took the morning very slowly. We fortunately had all day to make it back to Hanoi in time for our evening flight. 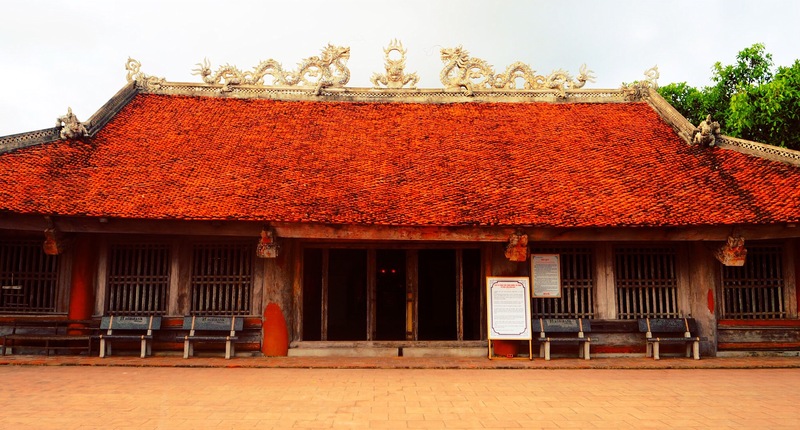 We had precious little time in Hue, due to our flying instead of overnight bussing down there, so we ended up with essentially one full day there. It turned out to be enough time, as the main thing we wanted to see was the Imperial City. 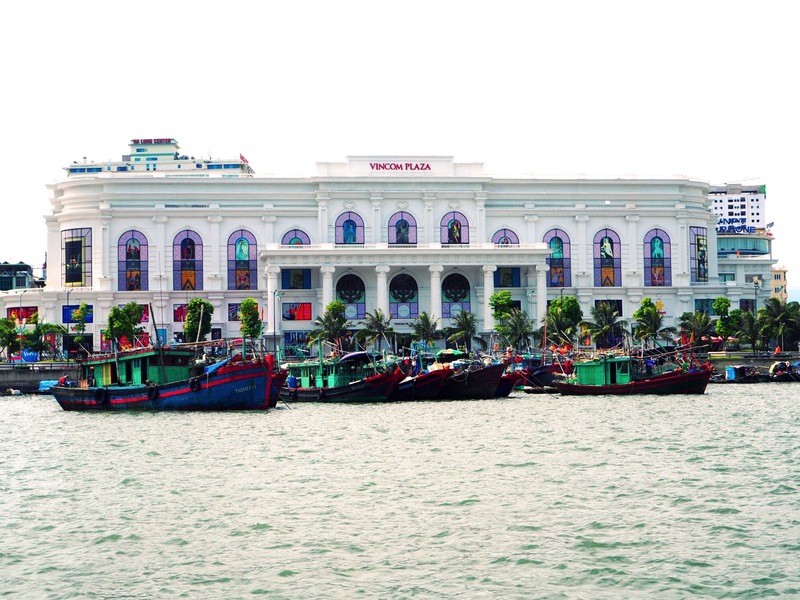 Hue, like a handful of other cities in Vietnam, as it seems, used to be the capital of Vietnam for some time, so there is a sizable royal palace in the center of the city, surrounded by the old town. We spent our day wandering through the Imperial City, which felt quite a bit like Beijing’s Forbidden City, except there were far fewer people, and it was much hotter. Way hotter. Like 45°C. Or at least it felt like that. Seriously, we were pouring sweat. Anyway, we had a pretty nice time wandering around town, and we got some bikes from our hotel to take a leisurely ride through the old town. The promenade along the river is also quite nice around sunset. We endured inhumane heat to get this shot. More beauty in the Imperial City. We figured, since we were here, we ought to try Hue’s famous food: bun bo Hue. It’s featured on the menu of many a Vietnamese restaurant in the west, so it would be a veritable travesty to leave town without having it. We asked for the best shop in town from our hotel, and they pointed us to an otherwise nondescript corner with a modest-looking storefront. Somebody who worked there, presumably, ambled by and asked “bún bò Huế?” although he already certainly knew the answer. The soup was good, but really not worth flying all the way there for, and we concluded that we are bigger fans of pho. Our next stop was Hoi An, some 130km south of Hue. There are a variety of options in getting there, including motorbike tours. We opted to book one of them, as we had heard great things about them. The basis is that you hop on the back of a motorbike with a local driver/tour guide, and they strap your bag to it and then you go, and visit some spots along the way, and then they drop you off in Hoi An. We booked ours through Hue Riders, as we had heard the best things about them, and heard some fairly negative experiences from the other ones. As it turns out, there are probably dozens of outfits doing the same things, but Hue Riders came up with the original idea more than a decade ago, and the other operations are a bunch of no-good Johnny-come-latelys. Well, that’s probably not entirely true. We tried to find Hue Riders’ office to book directly, but there are 12 storefronts that have the same number, and at least a few of them are also tour operators. We settled on what we thought was the correct one, but started getting weird vibes when they were insisting that they were Hue Riders, but there was no mention of that brand name anywhere except for on a small, very illegitimate-looking wooden sign hanging sideways on a column inside. They really wanted our business, and started offering discounts as we began to waver. Not content with organizing through some kind of Mickey Mouse operation, we backed off and tried to contact the real Hue Riders online, and they were very prompt in replying to an email, and ready to commit to a trip the following morning leaving at 8:30am. We learned after the fact that there are plenty of organizations (including Hue Riders) offering one-way motorbike rentals as well, which probably would have been more our style, but the tour option was fine too. They showed up to our hotel right on time, and as it turns out two other guests from the same hotel booked the same tour, so all seven of us (including drivers) set off. We visited a pretty uninteresting fishing village, but there were some pretty spectacularly green rice paddies on the way, which was cool. We also stopped off at Elephant Falls, which we occupied for a period with virtually every other tourist on every other motorcycle trip between Hue and Hoi An, which was some several dozen. There were also a considerable number of locals there, as it is now the summer holiday for Vietnamese schools. All in all, it was sort of depressing, as it was basically this really beautiful, natural place, which had been totally ruined by human presence. At any rate, we swam for a little bit, and then were content to head out. A fishing village on the way from Hue to Hoi An. A brief stop on the way. Next up was lunch, which was comprised of some fantastic seafood at a lagoon-side restaurant which was apparently very popular with the locals. The guides ate pork and rice though, which we suppose was a cost saving measure of sorts, but they seemed pretty happy about it. The highlight of the trip was probably the next bit, up and over Hai Van Pass, of Top Gear fame. The winding road climbs up and up and up, eventually crescendoing to a small collection of huts and a lookout point near the top. The views to both sides are spectacular, but mostly obscured by some inconveniently-placed high voltage lines. The view down from the other side. We cruised down through Da Nang, and stopped at Marble Mountain, at which point we were pretty exhausted, so we had just enough energy to climb the stairs, hang out for a short while on top, and then hop back on the bikes for the final leg. As we cruised into Hoi An, our tour guides dropped us at Kimmy Tailors for a brief chat about some custom clothing. The temple at Marble Mountain. Hoi An is the undisputed capital of tailors in Vietnam, and probably the world. There are more than 400 tailor shops in the town, which consists of only 120,000 people. It is quite common for tourists to get some custom clothes made while here, as a decent bespoke suit will only put you back around $200, and shirts and dresses and what have you are very affordable by western standards. The whole experience is very optimized towards getting you in and out though, so it’s often a matter of standing your ground over what you actually want, despite the tailor insisting that the current situation is good. Choosing the right shop can be a little intimidating as there are so many choices, so we were happy to be acquainted with Kimmy. We spent a vast majority of our time in Hoi An visiting tailors for fittings, as we ended up buying far more clothes than we had plans for. This was fairly nice though, as Hoi An is a lovely place to relax for a few days. After a session at Kimmy, we identified a few things that we wanted and they took our initial measurements and had us come back for a preliminary fitting the following day (in addition to being cheap, the tailors in Hoi An are also extremely fast). Walking by all the nice clothes at other shops, we started thinking that we may as well double down on clothes, as we’d need them when we finished traveling, and it’d be a lot cheaper to do it here. Our hotel was able to point us to another shop, Tuong Tailor, which meant that we got a chance to see how the two could compare. All told, we bought 14 shirts (! ), two dresses, a skirt, two coats, a pair of shorts, a leather handbag, and a couple of belts, and spent a small fraction of what we would have in the west. Kimmy is certainly the fancier of the two shops, but we appreciated the personal touch of the girls at Tuong. Virtually all the employees at all the shops that we saw were women, and as soon as you come in one of them “chooses” you and works with you throughout the whole process. We got along great with our tailors at Tuong, laughing and joking and generally having a good time, but we really like the clothes that we got from both shops. Most shops will handle shipping for you, and we were able to bring a veritable boat load of other things (including our garments from Kimmy) to ship back with our package from Tuong. So what did we do aside from tailoring huge amounts of clothes? Not much, really. We had a lot of great banh mi, and great food in general, and dabbled in a bit more bia hoi. Our friend David of David and Sara fame from Myanmar happened to be in town at the same time as well, so we met up with him and a friend of his for dinner on our last night in Hoi An. We settled on the well-respected Morning Glory in the old town, ordered vast quantities of food and a bottle of wine, and thoroughly enjoyed ourselves. The meal was certainly the best we had had in Vietnam, and practically every dish was a standout in some way or another. Honorable mention goes to the squid stuffed with minced pork and cao lao. Our amazing dinner at Morning Glory. We flew to Singapore the following day for a long layover on our way to the Philippines. We arrived in the late afternoon, checked into our tiny little room (that still cost a fortune) near Little India, and set out to get some Indian food, since that seemed like the thing to do there. We got some fantastic Indian food, and then ventured to the Mustafa Center, not far away, to stock up on some necessities before our trip to the Philippines. It would be a bit unfortunate for Ian to only see Little India (Oona has spent a decent amount of time in Singapore already, but it was Ian’s first time), so we headed to Clarke Quay for a quayside beer. We had a lovely, if not very short stay in Singapore, and headed out to Cebu the following morning.